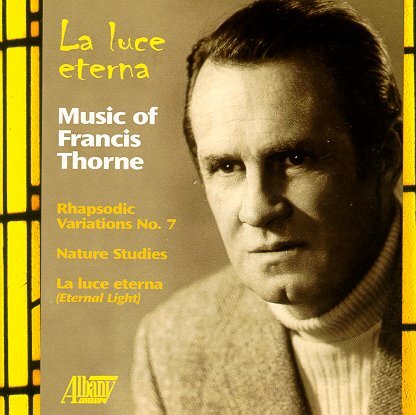 Francis Thorne Interview with Bruce Duffie . . . . . .
Francis Thorne (b. Bay Shore, New York, June 23, 1922) is an American composer of contemporary classical music and grandson of the writer Gustav Kobbé. His father was a ragtime pianist and his grandfather a Wagner critic. He was a student of Paul Hindemith at Yale University, before entering the U.S. Navy in 1942 where he served during World War II. After the war, he pursued a career on Wall Street and later, after Duke Ellington heard him play the piano and arranged an engagement for him at a New York jazz club, as a jazz pianist. 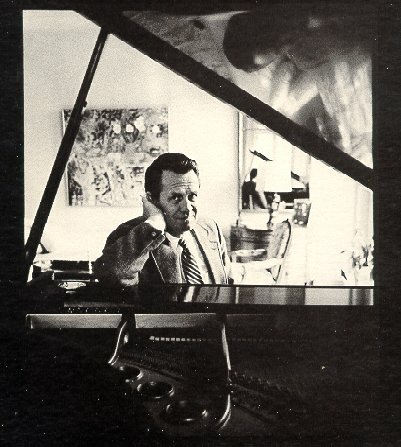 From 1959 to 1961 he studied composition in Florence with David Diamond, who encouraged him to incorporate his jazz sensitivities into his symphonic compositions. 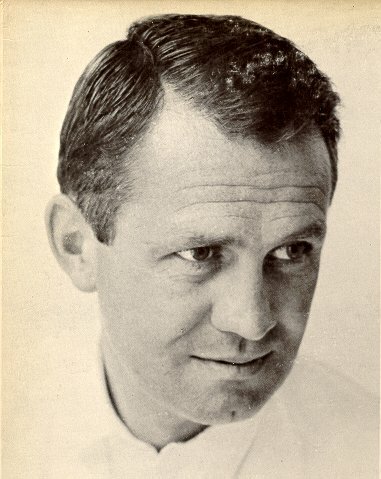 In December 1961, his first opera, Fortuna, premiered in New York City. In 1964 Eugene Ormandy and the Philadelphia Orchestra premiered his Elegy for Orchestra. In 1968 he was inducted into the American Academy and Institute of Arts and Letters. Thorne spent much of his career championing the works of emerging composers. He served as director of the Walter W. Naumburg Foundation and the Thorne Music Foundation from 1965–1974, organizations which commission new works by young composers. In 1977 he founded the American Composers Orchestra with Dennis Russell Davies. The orchestra focuses on performing new compositions by American composers. Many of his over 100 compositions are characterized by a distinct jazz flavor. He is also one of the first classical composers to write for the electric guitar and electric bass guitar (Sonar plexus, 1968; Liebesrock, 1968–69). A discussion of his works appears in R. Tomaro: Contemporary Compositional Techniques for the Electric Guitar in United States Concert Music. Thorne lives in Manhattan. The Francis Thorne Papers (1956-2004) are held by the New York Public Library. This is a man who has worked as a composer, assisted other composers and given time and effort for the good of all composers. It was my pleasure to make contact with him in 1986 and arrange for a telephone interview . 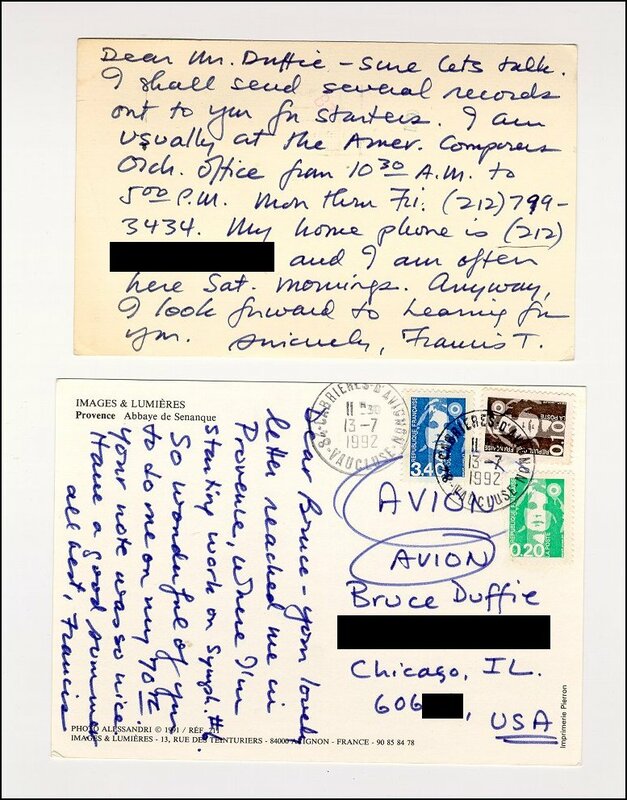 . . . .
Bruce Duffie: May I speak with Francis Thorne, please? Francis Thorne: Hi, this is he. FT: Yes, Bruce. Boy, are you on the button! BD: Radio people tend to watch the clock rather precisely. [Both laugh] Is this a good time for the interview? FT: Yes, it’s excellent. I made a point of being here to wait for you. BD: One of the things that interested me right away is that you are the Executive Director of the American Composers Alliance, and I’d like to ask about this. FT: I was until June of 1985. After ten years I resigned that position because the American Composers Orchestra was growing enough so that it was beginning to be important enough and demanding enough so I really couldn’t cope with that and composing. So if you still want to know about the Alliance, that’s fine. It’s part of my history. BD: How did the Alliance come into being? FT: The Alliance was started in 1937 by Aaron Copland because composers of concert music were not collecting any royalties for their performances. He decided if all the composers got together and formed a kind of union, that they could demand — and in fact they did demand and begin to get — royalties for their performances. This organization continued through the years. He was President for seven years and it grew. During the tenure that I had, from 1975 to ’85, the membership grew from about a hundred and fifty to something like three hundred and ten, from all over the country. It acts the way a publisher acts for the younger composers who don’t have a regular publisher. There’s a big rental library and a certain amount of promotion. 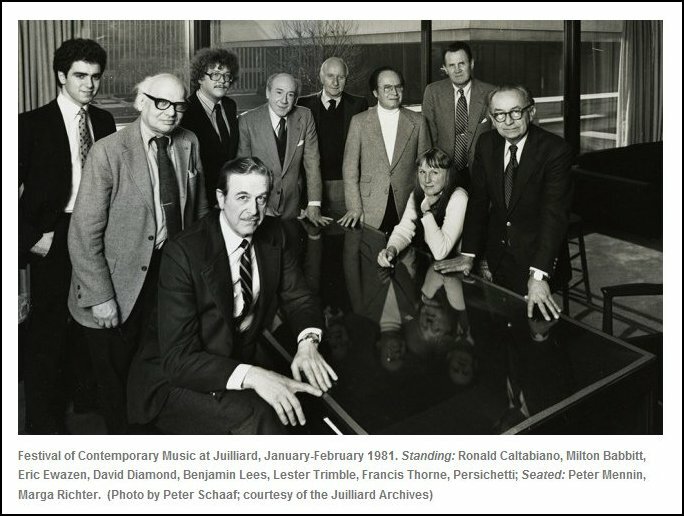 The Alliance has launched various projects, one of them being Composers Recordings, Incorporated, which they used to own and which became a non-profit organization in 1976. Then we launched the American Composers Orchestra, which as I mentioned, I’m in up to my ears with. It was the celebration of the fortieth anniversary of A.C.A., which took place in 1977 and in ’87 they’ll be planning something very exciting, I’m sure, for their fiftieth. BD: So it started collecting royalties on music that is performed by contemporary composers. FT: Well, that was the original intent. BD: Is that not something very similar to ASCAP or BMI? FT: Yes, but back then there was no such thing as BMI. That didn’t get started until 1940, and ASCAP was not collecting royalties for concert performances. So for a while they were the only ones doing it. Then eventually ASCAP began to do it, and then BMI came into existence. Eventually all the members of A.C.A. became members of BMI, and now, in fact, A.C.A. really operates as a subsidiary of BMI. It receives about two-thirds of its budget as a straight grant from BMI each year, to give the services to over three hundred BMI composers. So there was a rather important change there. But the purpose of its founding was as I described. Now it doesn’t do that anymore. BMI collects and distributes the royalties for the members of A.C.A. BD: I don’t know if this question is out line, but I’ve always been curious how a composer decides whether he will become affiliated with ASCAP or with BMI or with SESAC, or with any other agency. FT: The decision is usually to go with ASCAP and BMI because of the clout they have. SESAC is a far smaller organization. If you’re talking about composers of concert music, it’s usually a question of the money they will give you. Above and beyond the royalties you can collect, it’s pretty much of a toss-up. There’s a certain amount of competition between the two organizations and I wouldn’t say they raid each other’s stables, but there’s no question but that this kind of thing does go on in a rather subtle way from time to time. You’ll see composers switch from one to the other because they think they’re going to get more of that extra money. ASCAP does it in the form of what they call awards and BMI does it in what they call guarantees, but it’s just the same thing; they take a certain amount of money that they earn from the popular music and they divvy it up among their so-called serious composers on the basis that it’s a long term investment, and that there’s a certain amount of prestige involved, and so forth and so on. I’ve been a member of both ASCAP and BMI, so I have a little bit of experience in this being lured from one to the other. I’m in BMI now. BD: Is it anything like jumping from one network to another, like the anchor people do sometimes? FT: [Laughs] Well, I suppose you might say so, only the money isn’t the same! FT: The competition is horrendous. Really! I don’t think that I could have ever imagined a more competitive field — just because there’s so little reward, really. The performances by major orchestras are so few and everybody is so hungry for them that it’s a pretty dog-eat-dog field in many ways. BD: Are there too many composers around? FT: That’s a very good question. The number has proliferated enormously since World War Two. Before World War Two, when Aaron Copland founded A.C.A., he put out a call for composers from all over the country, and there weren’t really more than about a hundred or so that responded. Now if you did something like that, they would be in the thousands. BMI numbers their composers of concert music that are active with them in the thousands. They’re all over the place, and I mean composers who consider themselves professionals. Of course, there are people who write music and people who write music, but the number of those who do it as a profession increases enormously. BD: Not necessarily as an exclusive profession, but as a major profession? FT: A major profession, yes. BD: Do you do any teaching? FT: No. I’ve done it twice and I didn’t particularly like it. BD: Many composers I talk with compose and teach, and I ask how they divide their time. So how do you divide your time between composing and administrating? FT: Unlike William Schuman or Charles Wuorinen, I do not do it during the course of a day; I divide my year. I’m talking about the nitty-gritty of composing. I spend three months, sometimes more, in the summer outside of New York somewhere writing music. But that’s only part of it. Then in the winter I do the administrative work, and the copying and the proofreading and the promoting and the other things you have to do once the piece is written. So I divide my year; others do it in different ways. BD: Are you satisfied with the balance between the two, or would you rather give more time to one or the other? FT: I like the balance. I think I’m writing probably as much as I have got in me to come out. I usually write one major orchestra piece every year, and maybe a couple of chamber works. That’s sort of my average output. It might be a little bit less this year because I’ve been so very, very involved in fundraising for the orchestra. BD: Are the pieces you write on commission, or are they things that you just feel you have to write? FT: Starting around ’68 or ’69, virtually everything I’ve written has been on commission. Last year I found myself with a four month summer hiatus because I left the American Composers Alliance, so I spent the fourth month writing an orchestral overture which was not commissioned. Fortunately it has been picked up for a first performance next season, but normally I write in response to a commission. This often means for a specific group, which I think is a good incentive. I like writing and knowing whom I’m writing for. BD: Do you tailor your pieces, then? FT: I don’t think one can necessarily avoid doing that a little bit, especially if it’s a virtuoso orchestra or a virtuoso string quartet. Next year I have to write a piece that isn’t too difficult for a group called New Music for Young Ensembles, where they beg you not to make it too difficult. FT: Yes, right. So, that often colors the ideas. When you write for a certain singer, you write to their strong points. BD: Do you ever change things when the performance is then being given another time by another performer? FT: As a natural course, one would often make changes as a result of rehearsals or performances. I just made a big cut in my Fifth Symphony after the Albany Symphony did the premiere. I cut about two minutes out it. There were various and sundry reasons for doing that; I’m not a stick in the mud on that. If I feel a cut is needed, I’ll make it. Usually it’s just minor adjustments — dynamic changes or things like that. BD: If it is something as major as cutting out two minutes, what do you say to someone who might be listening to the tape of the premiere fifty years from now and wants to go back and play your urtext? FT: [Laughs] Well, I suppose they have a right to do that if they can find it. This piece is in the hands of Schirmer A.M.P., and they now have removed the master sheets. It was a fourth movement out of a five-movement piece, a little fanfare that just seemed to interrupt the real flow in the work. So I just simply cut the movement. BD: I see. Maybe it’ll come back a year from now as a little fanfare for somebody? FT: It very well might, as a matter of fact! It’s a perfectly good little fanfare; it just didn’t seem to fit in that piece. BD: So it’s a good piece, but in the wrong place? FT: [Laughs] It could be. BD: Let’s move on to the American Composers Orchestra. Tell me about this organization. FT: That’s very dear to my heart, needless to say. Back in 1975, Dennis Russell Davies asked me to have lunch with him. He wanted me to write a piece for the Cabrillo Music Festival in California. He had his concertmaster at the lunch, and we decided I would write a violin concerto. That took about five minutes to decide. Then he turned to me and he said, “Why don’t we have an orchestra here in New York that’s like the Cabrillo Festival Orchestra?” What he meant was about a fifty-piece orchestra of ringers, real virtuoso players. I thought that was kind of an interesting idea, and we got talking more and decided that because the American orchestras played so little American music, we should confine our efforts just to the American repertoire. That idea really got fixed in my mind. Just then I became Executive Director of A.C.A., and realized we had this fortieth anniversary to deal with a year and a half away. So I proposed this as a celebration to Nicholas Roussakis, who was the new President of A.C.A. It took about a year and a half to get all the money in place to put on one concert of orchestral music, which Dennis conducted on the 7th of February, 1977. The concert was a phenomenal success. The press was rhapsodic and the orchestra was fantastic! We decided we just couldn’t let this thing die, so we set up a new tax-exempt corporation with another board. We couldn’t just do A.C.A. music and get public funding, so we opened it up to ASCAP, BMI, SECAC — as long as it was an American composer, either naturalized or native born. The next year, we were able to put on three concerts. BD: All the music that’s played — are they first performances? FT: No, no. About one out of four pieces is a major revival, like for example a work by Charles Griffiths or Randall Thompson, or an early symphony by David Diamond, or something like that. Then we usually have a commissioned work on each program, but seventy-five percent of the work we do is the music of the last ten or twenty years. We’ve commissioned thirty-seven composers so far, and of course have given the world premieres of those pieces. We’ve also given about another twenty world premieres, so the premiere number is up to about sixty-seven. Two of our commissions have won the Pulitzer Prize, and one of them was by the first woman to receive the Pulitzer Prize. FT: Ellen Zwilich, yes. We commissioned that piece. It was called Three Movements for Orchestra, and then she changed the name to Symphony Number One. That was a real boost to her career. BD: She was here a few months ago with Chamber Music Chicago. Her Double Quartet was premiered and I got a chance to talk with her. She was very interesting. FT: Yes, and delightful, don’t you think? She is a wonderful person. We’ve really launched quite a few composers into a much higher orbit, like Joan Tower, who had never written an orchestra piece before. She wrote for us; or Joe Schwantner’s first orchestra piece. He wrote that for us and it won the Pulitzer Prize in 1979. Vincent Persichetti, and Marga Richter. BD: How do you decide what will get played and what will not — or is it a case of simply eliminating where you must? FT: I’ve had to kind of supervise the Programming Committee, which is usually several of my composer colleagues and Dennis. We get unsolicited scores that come in by the dozen, plus the fact that everyone on the committee usually has a few things they’ve heard that they want to propose! And Dennis always has a bunch of things he wants to propose. We kick it around and put the programs together. BD: It sounds like you have enough material to go three or four times as much as what you do. FT: Well, we do. The only trouble is that I really spend my time from September to May raising money. The fundraising end of it is a tremendously demanding job because no orchestra like this has really ever survived before. There have been other attempts made, and they’ve gone a year or two or three years, but this is the only one I know of that’s lasted for ten years. BD: Has this orchestra made some recordings? FT: Yes, there are six on C.R.I., and there’s one coming out on New World. My music has not been recorded by the A.C.O., but it will be next January. We’re going to have a tenth anniversary recording and my Fourth Symphony will be on there with Dennis conducting. The first three records were actually made because C.R.I. was able to raise the money. Then we had an Elliott Carter record which he funded. We finally were able to raise some extra money; usually it’s enough work just raising money to put on the concert. Another reason it was difficult was that the National Endowment urged us to move from three concerts, where we stayed for quite a few years, up to five. That happened about three years ago. They said if we gave five concerts, then they could fund us both as a new music group and as an orchestra, and we’d get a little extra. So we may have jumped up to that a little bit prematurely, but we did. We leveled off there at around three hundred thousand dollars in the budget. Then Carnegie Hall invited us to present this past season, which meant that they gave a grant of twenty thousand dollars which, when pro-rated per concert, made the hall cost less than Tully Hall. Plus we had the potential of filling twenty-eight hundred seats, versus a thousand in Tully Hall. We didn’t ever fill the hall, but we came very close with Leonard Bernstein conducting. BD: Is this really what new music needs, champions like Bernstein or Dennis Russell Davies? FT: I would say champions like Dennis Russell Davies. Bernstein hasn’t been championing new music for a long time. He used to when he was much younger. I think now that Leonard Slatkin and Dennis Russell Davies are the two that stand out particularly today, but I wish there were dozens of them. Then we wouldn’t really need the American Composers Orchestra, because all the orchestras would be doing American music. Actually, American repertoire has been growing, as a percentage, in many orchestras. The figures for the Bicentennial were six percent American for the major and metropolitan orchestras. But if you removed Bernstein, Copland, Ives, Schuman and Gershwin, it dropped to 1.7 percent. So you can see there was a vacuum to be filled. BD: Composers occasionally tell me that it’s not particularly hard to get a first performance, but it’s that second performance which is difficult. Is this true? FT: Well, try to get a first performance with the New York Philharmonic or the Philadelphia Orchestra or the Chicago Symphony. How many young American composers does the Chicago Symphony do per year? BD: Practically no young ones, but certainly several who are more established. FT: How do you get established? That’s the problem! I think one of the missions we have is to help establish them. We might only establish one per year, but Schwantner’s played all over the place now, as are Wuorinen and Tower. BD: Yes. Joan Tower and Wuorinen are both represented on next season’s Chicago Symphony concerts. FT: Well, Joan would never be there if we hadn’t launched her, believe me. She’s now composer-in-residence with the Saint Louis Symphony, but up until the time she wrote the orchestra piece for us, she had just been writing chamber music pieces for the Da Capo Chamber Players. This really transformed her life. BD: You’ve done a major service for hopefully a major composer. FT: Well, I think so. But it’s hard to get a first performance. I don’t go along with that theory at all. Maybe it’s harder to get the second one, but look what happened to Joan. She got performed by us and then Zubin Mehta liked the piece, so he took it on. The next thing you know, everyone was playing her. But you’ve got to get that first one! BD: When we were talking about ASCAP and BMI, you were mentioning that a lot of the money from the pop area gets funneled over into the concert area. Is there an imaginary line, or is it really a division between concert and pop, either in the artists or the audience? FT: There’s a lot of talk about crossover today, as you know. What is Phillip Glass? What is Steve Reich? In a way, they are as much of a pop nature as a serious classical concert music nature. I don’t know. That’s a very hard question to answer. It’s also a question of whether the music is put on pop programs or ghettoized; some of these orchestras have little festivals or special concerts where they put all the new things. In San Francisco they have concerts with a somewhat smaller number of players. The real question is, what actually works its way onto their subscription programs? BD: Is it better for a piece of yours to be played in an all-contemporary concert, or would it be better to drop it into the midst of a concert of Bach and Mozart and Janáček? FT: I’ll give you a very specific example. A little over twenty years ago, Ormandy played a piece of mine with the Schumann Second Symphony, and the Chopin E Minor Concerto. That’s where you really want to be, because it was done three times. And of course, if it goes on tour then it’s done more. But that’s really what everybody’s heart’s desire is. There are many more cases where you would get on a program of contemporary music, and a lot of times these pieces cancel each other out. That’s one of the real problems we have with putting on an A.C.O. program, that pieces don’t kill each other off! One way you have to cope with that is to have pieces that are very different, so that there’s a lot of contrast from one piece to another. But I certainly believe it strongly that most composers would much rather be on a program with pieces that are not contemporary, unless there’s some relationship there. BD: Are there composers coming along that you feel will take their places beside the great masters? FT: I hope so! [Laughs] I think a composer like Charles Wuorinen is already a great master. His earlier music, I think, was a little bit too rigorous to attract a large public, but in the last couple of years I’ve seen him receive standing ovations for performances with major orchestras. Not that standing ovations means that someone is a great master, it’s just that a person that I thought for years was a great master is beginning to be recognized by a much larger public. On the other hand, it may be that Carter is a master, but you had a little scandal there in Chicago, I understand, where Slatkin started lecturing the audience about Carter, and Carter walked out. Do you remember that? FT: It came out in the New York Times. But he could very well be a master. That’s a little bit like Russian roulette, trying to do that kind of guesswork. When I was first going to concerts in the thirties, they were saying, “Sibelius is very popular now, but in twenty years no one will remember him.” The same was said about Rachmaninoff and they seem to be going pretty strong today. BD: Do you feel that the public dictates what is played? FT: Maybe not initially, but let’s turn that around. As we know, most conductors have rather large egos, and they want to have a great success with their career; they want the things they do to be successful with the public, obviously. If they try something and it doesn’t particularly work, they’re not going to do it again. There’s this network, and the word gets around. On the other hand, if the word gets around that something does work, it’ll get picked up by others, just the way Joan Tower did. It went around the country like wildfire that she was someone to watch. I’m not sure I’m answering your question. BD: Well, public taste will swing back and forth and composers will go in and out of fashion. Do you feel that public taste is always right? FT: No, I don’t think so. There was a time when the public wouldn’t sit and listen to a Wuorinen or a Carter. I don’t think that Wuorinen and Carter have necessarily compromised, particularly in the last twenty years, but maybe the fact is that the public has finally caught up with them. BD: What can the public expect of a composer? Or what are the obligations of a composer to the public? FT: That really depends on whether the composer wants to woo the public. Milton Babbitt’s an interesting example. Back in the sixties, he talked about, “I write for myself and I write for a few intelligent listeners, and the hell with the public. Who cares if you listen anyway?” But no sooner does he get a commission from the Cleveland Orchestra that he writes Relata I, and then followed it with Relata II for the New York Philharmonic. I think that composers want to be loved, and if they won’t admit it, they’re being hypocrites. BD: Then let me ask a dangerous question — for whom does Francis Thorne write? BD: You should be your own man. FT: [Laughs] It’s too damn much work to write music unless you are! But I had to go through something of a personal experience to finally face that fact. BD: Is musical composition something that can be taught, or must it really be learned from within? FT: There are plenty of composition teachers around, so I suppose it can be taught. My own personal answer is that I had studied with Hindemith at Yale, and didn’t learn anything except maybe a little counterpoint. But that isn’t composition. I had several other composition teachers, and finally I figured I’m just going to have to do it for myself. That didn’t get me very far because there are techniques that are hard to pick up unless you’re kind of a genius. So when I wound up with David Diamond, I learned a lot because Diamond thought that I was a very interesting musician. I’d been a jazz pianist for about five years just before I met him. That was my career, so I was out making my living and he was fascinated by that. I improvised for him and he said, “I’d really like to work with you, if you want.” So I became a private pupil of his in Florence, and during the course of that time, it was kind of like some magic. He made me study some scores and he made me read some books and listen to some records. But what he really did was keep telling me that I could do it and that I had a major talent; that all I had to do was write music and bring it to him, and he would tell me, “Your balance isn’t very good here; this is going to drown out that. Somehow or other the structure is a little bit confused; you ought to think about maybe doing this.” But he didn’t say do it! He said, “Just think about it, maybe.” It was that kind of thing. As a result of working with a man like that, I became a composer. So I suppose I was being taught, but I never felt he was teaching me. I felt he was leading me, making suggestions or little comments that I could take or leave. I’m a very intuitive composer; I’m not intellectual at all. BD: Then where is the balance between inspiration and technique? FT: I think you certainly have to have both. There are techniques involved. You have to learn about orchestration, what instruments can do and how you can combine them. You have to learn a little bit about the techniques of structure and logical progression, and so forth. And then you certainly have to have something to say. You can have something to say, and if you don’t know how to say it, that’s kind of a dead end. So you really need the two, it seems to me. BD: A little while earlier we were talking about “crossover.” You used jazz in some of your music and it was a big influence in your music. BD: Are you nearly alone in managing to bring together classical and jazz, or jazz, pop and classical? FT: I don’t think so. There are composers who have done it quite well, like Meyer Kupferman and Gunther Schuller. There’s a long list and it includes Bela Bartók! How about the Music for Strings, Percussion, and Celeste? The opening fugue is pure blues and then the second movement is really jazzy. I once had an argument with critic Harold Schonberg on that piece, and he finally admitted that he thought I had a point, especially about the opening fugue being very bluesy. In fact, if I were to make a guess as to which influence was stronger, the twelve-tone system or jazz, as far as the music that will survive into the next century, I’ll bet my money on jazz every time because of the rhythmic vitality and the kind of Afro-American gesture that’s involved in this kind of music. BD: So then you’re basically optimistic about the future of music? BD: If we don’t blow ourselves up, then the music will survive? FT: Oh, I think so. But the music that will survive is the music that reaches out and speaks to a bunch of human beings. It’s a question of music as a humanity. One really has to take into account the fact that those people out there are people! They’re human beings and they have responses. You just hope to hell that you can trigger some of those responses. Not that you pander; you have your own integrity to consider, too. But it’s kind of pointless not to consider that you’re speaking a language of some kind, and that you’re trying to communicate to somebody with that language. Otherwise it’s too much work for no purpose! BD: Are you generally pleased with the recordings that have been made of your music? FT: Yes and no. The Seven Set Pieces are quite well performed, and the Burlesque Overture and Rhapsodic Variations are pretty well performed. I’m not too happy with the Liebesrock. FT: I was supposed to be at the session with the Royal Philharmonic, but I got fogged out of London and landed in Frankfurt, and they had to have the session without me. I was going to rehearse the three electric guitars and then we were going to put it together. So we had to dub in some of the guitar music, and that didn’t turn out to be all that satisfactory. I have a marvelous recording — I like it, anyway — of my Third String Quartet and Nature Studies done by the Jubal Trio. That C.R.I. record came out not too long ago and was very well done on both accounts. I’m very fond of that record. BD: When I’m setting up a program, I must try to fit various pieces into the time frame that we have, but I might as well at least try to fit in mostly pieces that you’re pleased with. FT: I’d even include Liebesrock, because I think it’s kind of an interesting piece. BD: That’s the one that seems to have gotten a bit of notoriety. FT: [Laughs] It’s just that I would have much preferred if we’d had all the guitars, and done the whole thing in the session in London, rather than having to overdub. Anyway, that’s neither here nor there. There was one recording that I had high hopes for. The Louisville Orchestra recorded my Elegy — which is the piece that Ormandy did in ’64 — and I just don’t like that recording. It really annoys me. This is the kind of thing that happens sometimes. The piece was sent down there. The publisher and the conductor [Jorge Mester] were in cahoots, and I didn’t find out about the recording until after it had taken place. It’s a thirteen minute piece that lasts for about fifteen and a half minutes; it just dies! So that’s the kind of thing that can happen, and I think it’s kind of a shame when the composer is not included in a project like that. BD: Let me turn the coin over. Do you feel that conductors or performers ever find things in your music that you did not know were there? FT: Yes, that can happen, very definitely. It often happens in the case of tempo, where I have felt a certain tempo and a conductor will feel another tempo. Sometimes they’re right. I remember when I went to Philadelphia, Ormandy said, “I don’t like the way you phrased this brass chorale. I think it should flow more, and you have it sort of broken up into segments with pauses.” So he handed me his stick and he said, “Here, you do it your way and then I’ll do it my way, and then we’ll decide.” That showed me that he cared, and an improvement was made. So one has to be alert to somebody who is well-trained and does care to take the trouble to make a suggestion; I don’t think you should get up on your high horse. A singer might question a note or a phrase and sometimes you can make it better, especially if the singer is more comfortable with it. BD: Then you’re conscious of comments that come from the performer. FT: Oh, yes, I always listen. I don’t always follow [laughs], but I always listen! BD: Has there ever been a time in your life when you felt that turning down the partnership with the stock firm was a mistake? FT: Oh! [Laughs] That must have been in the program notes. No, I never regretted that for a second! If I had regretted it, it would simply be from a purely financial point of view. I obviously would have had a much higher income over the years if I had stayed down there. But as far as satisfaction and having a ball is concerned, I don’t regret it for a minute. BD: You had a bit of money from the family. Did this influence your decision at all, or make it easier for you to do what you wanted? FT: It certainly made the first decision to leave Wall Street. I had also made some money of my own, but by the time my career as a composer was getting underway — and I date that from Ormandy — I’d run through all that. So I was back to more or less in the same situation most of my colleagues were, which was that I had to work out some sort of a way of earning some money. That’s how I became an administrator, and I think that was good for me. If I had had enough money not to do that, I think some kind of generating force might have been lost. It’s a wonderful combination to have to fight a little bit for the right of myself as a composer, as against myself as an administrator. Of course the project that I’m involved with, this orchestra, is so damn much fun! There is kind of the lollypop of being performed by the A.C.O., but I installed a rule that no composer, myself included, should be done more than once every five years because there are so many out there who should be done by us. As you know, there are some other groups where the people in charge are playing their music all the time, but I didn’t want it to be that way with the A.C.O. I wanted it to be more catholic. BD: You didn’t want it to be a personal vehicle for you or anyone else? FT: That’s right. And yet I didn’t feel that I should rule myself out, the way Menotti did for many years in Spoleto. For many, many years they never did his music because he wouldn’t allow it. But I think that’s going a little far, especially as I write a lot of orchestra music, and I want to hear it occasionally. BD: I want to ask you about one more name — Gustav Kobbé. Tell me a bit about his influence upon you in your life. FT: Do you know his famous Complete Opera Book? BD: Oh sure. I refer to it all the time. FT: Actually he published about thirteen books during the course of his life. In 1918, which is four years before I was born, he was out sailing on the Great South Bay where they had a seaplane base out there. A young pilot was buzzing his sailboat, and he misjudged and crashed into the boat and killed my grandfather. So I never knew him, but his influence was enormous because his widow and his oldest daughter, my Aunt Beatrice, carried on his adoration of Wagner. He had gone to Bayreuth and reviewed the world premiere of Parsifal, and did an interview with Wagner. He had the chance to meet him several times and there was this carryover of Wagner worship in the family. I lived in New York and I began to be taken to the opera at the age of eight. I first heard Tannhäuser and Tristan, and over the next dozen years or so I heard nothing but Wagner, because that’s all the family wanted to hear. BD: Of course those were the great days of Wagner at the Met. FT: We had the great Flagstad-Melchior days, and others during that time including Lotte Lehmann. So it was kind of wonderful, but it was a bit one-tracked, because they also liked to put down the Italian School and the French School. They really wouldn’t hear anything but Wagner! Fortunately I also was able to get to some concerts and heard a few other composers, too! [Laughs] But as far as opera was concerned, Wagner was it. In a funny or sort of way, it had a good influence because I’ve always been absolutely beguiled by the harmonies of Wagner. They still enchant and mystify me. I think my own harmonic structures are quite chromatic, and are obviously influenced by this since it goes back into the earliest part of my childhood. BD: When you decided to become a composer, why did you not want to write operas or music dramas? BD: Are those the great American operas? FT: They are to me. To me, they’re much more valid as something that we’re contributing to our musical life. I can’t think of very many American operas that I would want to hear again. There may be one here and there; Bob Ward’s The Crucible is a pretty good piece. BD: The opera’s a nice place to visit, but you don’t want to work there? FT: [Laughs] I have worked off-Broadway. Twenty-five years ago I did a rather West Side-ish kind of thing — as far as the musical textures are concerned. But it was a big, grand flop, and there was never any particular invitation to go back into that field. Then the concert stuff began to work, and one does tend to stick with the things that are working. I’ve always been fascinated by the symphony orchestra anyway. BD: As well as being a composer, you’ve been an observer of the musical scene now for over fifty years. How have performers changed? Have they gotten better in that time? FT: It seems to me that the quality of orchestral playing has improved. Not necessarily the great few, but there are so many really good ensembles around. That, I think, is something that we can really boast of in this country. Some of the best performances I’ve had have been by the Youngstown Symphony or the Albany Symphony or the Oklahoma Symphony. They have given me really first-class performances. As far as the great artists are concerned, when I was a kid I heard Rachmaninoff and Hoffmann and Flagstad. I have never heard a singer to this day that I think could compare to Flagstad for the absolute beauty of the tone that she poured out. I don’t suppose they are any better or any worse pianists today than the pianists of the twenties and thirties, but I do know that the number of first-rate orchestras is really mind-boggling today. And of course, that is a great incentive to write for them, if they’ll only play your stuff! [Both laugh] I think the A.C.O. is an incredible orchestra. BD: But that, you say, was hand-picked virtuosi. FT: That’s right, that’s right. But the Buffalo Philharmonic and that Cabrillo Festival Orchestra are absolutely wonderful, and the Juilliard Orchestra is a fine orchestra! To find an orchestra of that caliber in a school, I think, says a lot for what we have here today. BD: Do you feel that the public has also grown in the last fifty years? BD: In their ability to cope with music. FT: I wonder about that; it seems to take so long. Look at the career of Bartók, which didn’t really take off ‘til after he died. It took a long time for the works we now take for granted to get into the repertoire. I’m not sure it’s any different today. It’s always going to be a slow process because you can’t just hear something once. You have to hear it over and over again to get it into your head, and there aren’t that many recordings of contemporary music. And how many people buy them? BD: Do you feel that the recordings, especially of the standard repertoire, have made a wrong impression on the audience? FT: They expect to hear a certain kind of thing when they go into the concert hall, and when they hear something quite different, they can get quite angry. They’re still stalking out of the New York Philharmonic when Mehta programs Schoenberg or Alban Berg. He had a funny little thing happen last year. He had programmed soprano Carol Farley to sing some Berg at the end of the program, and everyone was leaving just before that. So he came out at the intermission and said that he thought the audience was so responsive to this music that he thought he’d put it right away, and switched the order of the program around. BD: So how can we get the public to be more enamored of contemporary music? FT: That’s hard to answer. The music, of course, has to reach out and be more attractive, and I think that is happening. It seems to me that the public is accepting more contemporary music today. The success of Ellen Zwilich and Joan Tower and Joe Schwantner and David Del Tredici is proving this. I went to the American Symphony Orchestra a week ago, and they only played one piece; it was two and a half hours of David Del Tredici. It was four of the Alice things, which were combined in one unit called Child Alice. In Chicago, you had his first stupendous success. BD: Yes, with the Final Alice. FT: The Final Alice transformed his career, and I gather that the audience loved that piece. At least, he said they did! 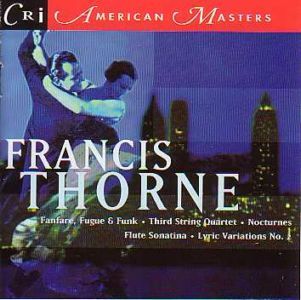 BD: What is next on the calendar for Francis Thorne? FT: I’m going back to chamber music. I’m just getting my head together for a piece for oboe and string quartet, which I’m very, very much looking forward to working on. I intend to devote the entire summer to it because I want it really to be good. I’ve never written a major work for the oboe, and it’s such a wonderful instrument. I did write a short piece for oboe and harpsichord some years ago. BD: Have you got an oboist in mind or someone who has said they would play it? FT: I have worked with Bert Lucarelli and would like him to do it, but the commission came from New Music for Young Ensembles, and Bert may not be young enough to fall into that category! [Both laugh] I’m hoping to have that knowledge before I go away for the summer. Actually, everything I have to write in the next year or so is for chamber ensemble, which is just as well because the last four pieces I’ve written have been for orchestra. I have a piece coming up this summer that I’m very excited about. It’s called Concerto Concertante for flute, clarinet, violin, cello and orchestra. That’s being done at the New Hampshire Music Festival, which commissioned it last year. I’m proofreading parts on that right now. BD: It sounds like you’re going to be kept very, very busy. FT: I’ll be busy enough. I don’t like to overload myself because I don’t think you do your best work if you’re too frantic or under too much pressure. I don’t, certainly. So I’m very comfortable with what I have on my plate right now. BD: That’s an enviable position to be in. FT: It’s taken a while to get there. We have the same deal with Carnegie Hall for the next two years with the American Composers Orchestra. I thought when they put a new Artistic Director in there, Judith Aaron, that possibly things would change, but she seems to be very pleased to have us there. They have been very, very hospitable to us. Of course, we sound so much better in there than we did in Tully Hall. That’s a real orchestra hall. It is magnificent — comparable to yours in Chicago. BD: I want to thank you for being a composer, and also for all of the other things that you have done for contemporary music. It seems that you are almost unique in that — being a composer and also doing things for other composers and promoting contemporary music. FT: Well, it’s very kind of you to say it. I hated to feel that my nine years of business experience was wasted. Now, of course, it’s wonderful because I’ve been able to work on projects and be Treasurer of the orchestra, as well as the other things. I enjoy the fundraising end of it because I believe in the cause so much. So here I am, almost in my middle sixties, and I think I’ve weeded out the excess and the surplus and the unnecessary, and have gotten down to the essentials. The two things do complement each other extremely well. BD: And I want to thank you also for spending the hour with me this afternoon. It’s been very enlightening, and very informative. FT: Well, thank you, Mr. Duffie. It’s been a great pleasure. I think everyone likes to talk about themselves a little bit, occasionally! Thorne’s first orchestral work after completing his studies with Diamond was Elegy for Orchestra. When Eugene Ormandy premiered it with the Philadelphia Orchestra in 1964, the Philadelphia Bulletin described it as “deeply felt and effective.” The success of Elegy brought Thorne back from Florence to New York, where he has been combining music administration and composing for over 35 years. His catalogue of 117 works includes seven symphonies, fifteen concerti, four string quartets, and the opera Mario and the Magician. He has been Executive Director of the Walter M. Naumburg Foundation and the American Composers Alliance, and President and CEO of the American Composers Orchestra since 1976. He also spent two years as Executive Director of Lyn Austin’s Music Theater Group and, for seven years, he ran the Thorne Music Fund which awarded three-year fellowships to American composers of “mature years and recognized accomplishments.” Recipients of these fellowships included Stefan Wolpe, Ben Weber, Lou Harrison, David Diamond, Jacob Druckman, Lucia Dlugoszewski, and Henry Brant among others. He has served on the Boards of the MacDowell Colony, The Manhattan School of Music, Composers Recordings, Inc., American Music Center, American Brass Quintet, the Group for Contemporary Music, the American Composers Alliance, and the Walter M. Naumburg Foundation. He has also served on the music panel of the New York State Council on the Arts. He has received commissions from, among others, the Seattle Symphony, Buffalo Philharmonic, Brooklyn Philharmonic, Albany Symphony (three times), Youngstown and Shreveport Symphonies, Valerie Bettis Dance Company, New Haven and Springfield Symphonies, Saint Paul Chamber Orchestra, and the Cabrillo Festival as well as numerous chamber ensembles. Other important orchestral performances have been with the Minnesota Orchestra, the Indianapolis Symphony, the Denver Symphony, the Baltimore Symphony, the Kansas City Philharmonic, the New York Pops Orchestra, the Guggenheim Concert Band, the Westchester Philharmonic, and American Composers Orchestra. Thorne lives with his wife, Ann, in New York City. He has three daughters and four grandsons. His music is published by Merion Music (Theodore Presser Company), C.F. Peters, and General Music, and is recorded on New World Records, CRI, Louisville and Serenus. 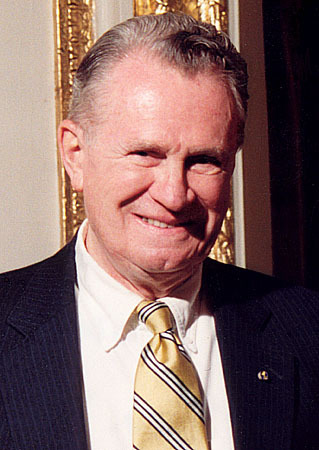 He was elected in 1988 to membership in the American Academy of Arts and Letters. He also belongs to the American Composers Alliance, American Music Center, and is currently a member of the Century Association and Broadcast Music, Inc. (BMI). This interview was recorded on the telephone on May 3, 1986. Portions were used (along with recordings) on WNIB in 1987, 1992 and 1997. A copy of the audio tape was given to the Archive of Contemporary Music at Northwestern University. The transcription was made and posted on this website in 2009.